Heat oven to 350°F. Grease 9-inch round cake pan or 8-inch square pan; sprinkle with Bisquick mix. In large bowl, beat all cake ingredients except mango with electric mixer on low speed 30 seconds, scraping bowl constantly. Beat on medium speed 4 minutes, scraping bowl occasionally. Fold in mango. Pour into pan. Bake 30 to 35 minutes or until toothpick inserted in center comes out clean. Meanwhile, in small bowl, mix all topping ingredients until well blended. Spread topping over warm cake. Broil cake with top 3 inches from heat about 3 minutes or until topping is golden brown. Cool 30 minutes before serving. If desired, serve with sweetened whipped cream. Pineapple Cake: Substitute ground cinnamon for the nutmeg and 1 can (20 ounces) crushed pineapple, well drained, for the mango. 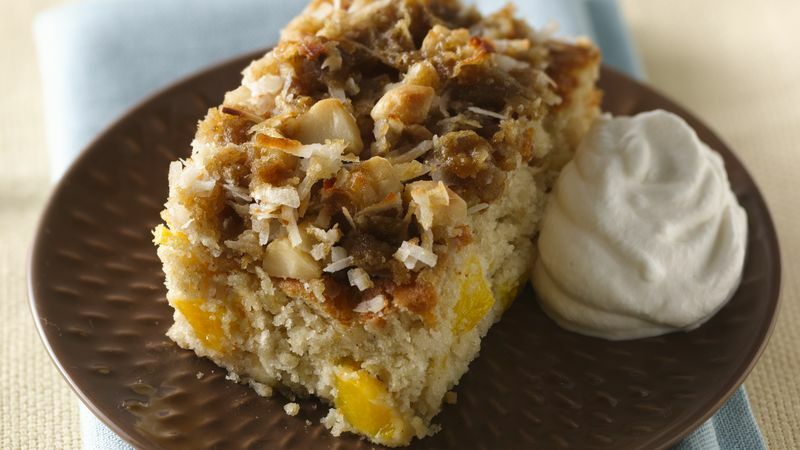 Substitute pecans for the macadamia nuts in the topping.